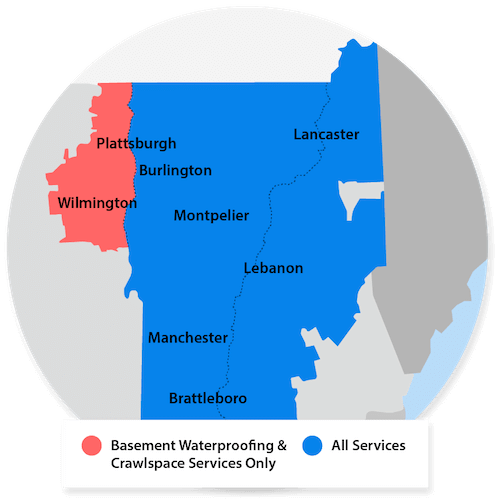 At Northern Basement Systems, we install only the best sump pump systems available anywhere in the Vermont and New Hampshire area. We have an answer to clogging sump pumps, power failures, torrential rainfall, and much more! We service Burlington, Keene, Colchester as well as Rutland, Laconia, South Burlington, Bennington, Brattleboro, St Albans, Montpelier, Concord, Lebanon, South Woodstock, Hanover, Milton, Berlin, Claremont and nearby. We can help you dry your basement! For a free sump pump system quote, call or e-mail us today!